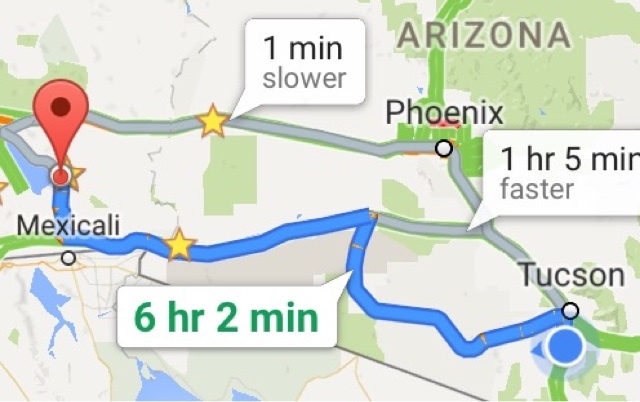 On Monday, February 8th (Day 36) I left Slab City, CA to make my way to Tucson, AZ as I changed my schedule around to try to meet up with a childhood friend next weekend from MA who lives in AZ. I left the slabs just after 7:00 and headed to Brawley, CA for downloads and unsweetened iced tea before getting in I8 east heading for a quick stop in Algodones, Mexico to buy a gift for someone before heading into Arazona. It is so easy to go to Mexico at this crossing as the downtown is at the border entrance. I went in and came back in less than an hour. I knew kind of what I wanted and I went back to the 20 something woman that sold me something the last time I was there. She remembered me from my visit a few weeks ago, so she gave me a discount off her regular price. I don't argue prices down unless I know it's too high. In this case it was good business for the few dollar discount. She thanked me and told the 30 something guy with her that I was a return customer and he was grateful. He doesn't speak as much English as the young girl, but he said thank you and I knew he appreciated my visit. There is so much competition for the dollars that I kind of seek out those that are less aggressive for my business. In the picture above where the 6 hr 2 min flag is pointing on the map is where I stayed for the night. It was a long drive to Ticson and I could have continued to Tucson but I haven't been on this segment of road for many years and I wanted to take it as a diversion to the highway. 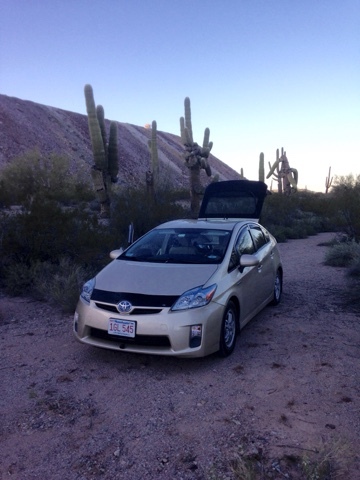 This picture of the Prius is on BLM land just south of Ajo, AZ. It is off the side of a well maintained dirt road. I found this flat spot that my Prius could get in and out of. I didn't take a picture of this 200 ft circle I was in, as when I got there there was someone on the far right side as I came down the embankment. I backed into a small spot across from a guy in his pick up truck with cap on it and before I could get of my car he was right over to me. He asks me this rhetorical question "Are you here to see me?" Of course he knew I wasn't here to see him but I have learned not to rise to the occasion and told him I saw this BLM land on the map and needed a place to stay for the night and would be gone before 8:00. I was the only other vehicle where more could fit and I was 200 ft away from him. After my opening comment to hope to remind him that BLM land is open to all and this little spot wasn't owned by him. Iintroduced myself by name and we ended up having a good conversation. In his own way he was trying to intimidate me to have me leave and I just played nice and all was good. This was similar to the guy in Slab City that talked about me taking pictures when I wasn't, as a way to intimidate me. See my post on revisiting the Slabs on an update with this guy and other unique people there. Tuesday morning (Day 37) I had left this spot before 8:00, and he wasn't up yet. 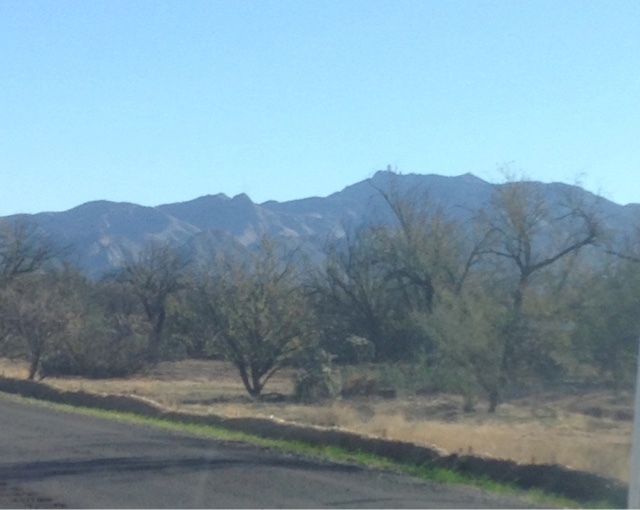 I headed south to Wye, AZ where I turned east to Tucson. In this road I pass Kitt Mountain where there is the National Observatory. Picture above. I wrote abut this in my 2015 travels when I visited it. After a stop at the first McDonalds I came to in Tucson for iced tea and I got crappy Internet, I left with very little downloads to go to the Post Office to mail the gift I got in Mexico back to MA. The line at this Tucson Post Office was at least 30 minutes long line so I drove to another town 12 miles south where there was no line and there was another Mcdonalds and it has very fast internet so I got downloads and app updates on both my IPhone and iPad. 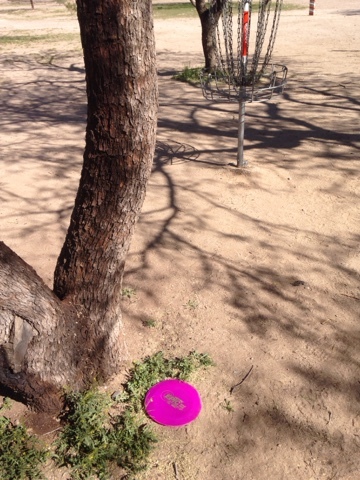 Then it was off to Santa Cruz River Park in Tucson to play Disc Golf. 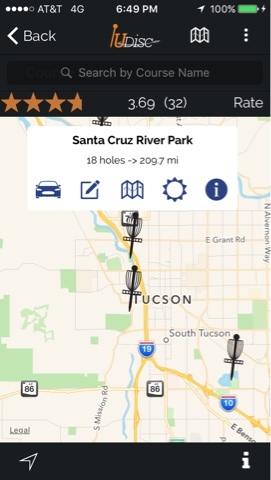 Above is the app I use called UDisc that finds the Disc Golf courses as I wander around on my travels. I played the shorter tee on this course as the longer ones have some obstructions and wasn't up for the challenge. Well on hole 9 at 204 feet my best toss of the day overshot the basket by at least 6 feet. As you can imagine I was pleased as I normally throw 150 to 175. 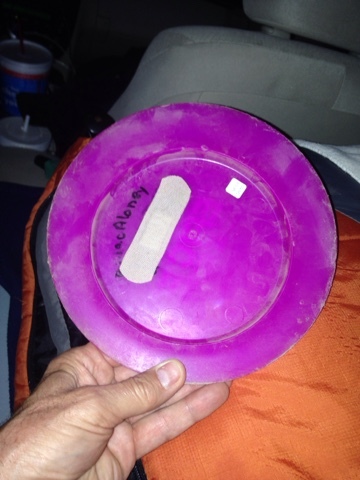 But I used my oblong disc that I had given to my east coast son and he didn't like it. He tosses backhand and I throw my drives forward hand, and the disc is better suited for my throw he says. A view of the top of the disc all you can see is that it's symmetrical, but underside it is oblong. I have been getting used to it as my driver and I'm liking it. My fingers are holding it on the smaller rim. 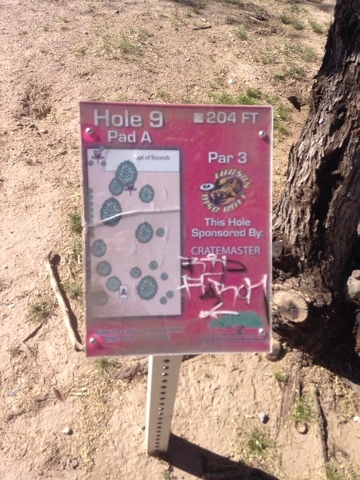 I made the putt on hole 9 for a par 2 on this par 3 hole. While I was playing hole 3 a coyote walked by me about 100 feet away. My presence didn't phase him as he marched along down the multipurpose path that passes the park/course. The bandaid is there on the disc to cover my phone number that's there in case I loose the disc. Fireworks Over Havasu - "They Won't Disappoint." Will A Pickup Camper Be In My Future? Do They Need The Money? Where Did All The Dollar a Coins Go?